Currently, weather forecasts are calling for strong winds tomorrow evening through Wednesday afternoon. Tomorrow afternoon, sustained winds from the south are predicted at speeds just under the 35 km/hr threshold. Beginning tomorrow evening the sustained winds are predicted to rise, peaking in the early hours of Tuesday morning at around 50 km/hr with gust of around 70 km/hr. Sustained winds above 40 km/hr from the southwest are expected all day Tuesday. Tuesday evening, those sustained winds are expected to switch to the west and to remain above 40 km /hr into Wednesday morning and above 35 km/hr into Wednesday afternoon. Environment Canada’s Marine Forecast has not yet issued any strong wind warnings, and wave forecasts only predict wave heights out until tomorrow at noon when they are expected to be around 1 m in height. 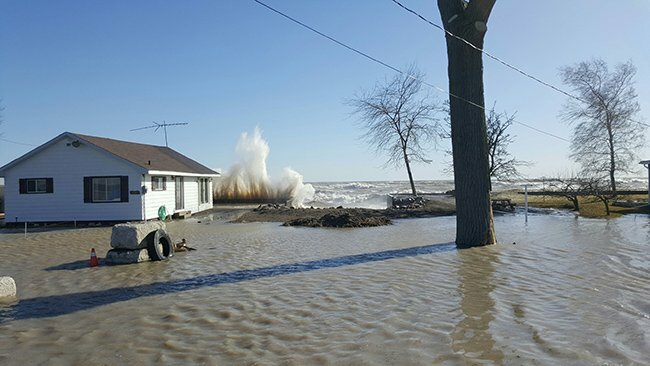 Earlier this year, flooding has occurred along Erie Shore Drive in Chatham-Kent when the area experiences sustained winds above 35 km/hr from the south (southeast through southwest). As the expected winds for tomorrow afternoon are just below this threshold, there is the possibility of flooding during this period. The longer range forecasts, although less reliable, would seem to indicate that flooding should be expected tomorrow evening, overnight, and throughout the day Tuesday. When the winds switch to the west, they will generally be alongshore, however if they shift to the south during this period, there could be more flooding. Associated with the flooding, there is a risk that wave action could damage shoreline protection works and cause shoreline erosion in vulnerable areas. Residents in vulnerable areas along the Lake Erie shoreline should pay attention to local weather forecasts. This message will be in effect until December 7 th, 2017. Contact: Jason Wintermute ( 519 – 354 – 7310 x227, j ason. w intermute@ltvca.ca ) regarding this message.